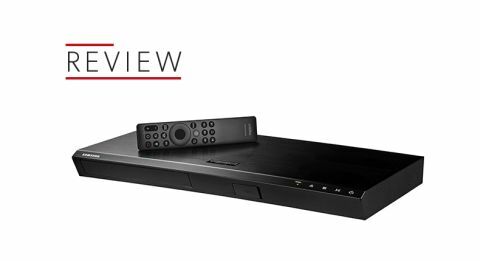 Samsung UBD-M9000 4K Blu-ray player review | What Hi-Fi? For the visually impaired among us, getting your first pair of glasses is always a slightly odd experience. You’re used to seeing the world a certain way, but put on your specs and suddenly everything is clearer and more detailed. That’s how it feels making the step up from regular Blu-ray to 4K Blu-ray. Your favourite films are magically more textured and, if your player supports HDR too, more colourful - although admittedly that’s something a pair of glasses can’t replicate. That’s also the effect that Samsung’s latest player, the UDB-M9000, is looking to achieve. It’s not the company’s first stab at a 4K HDR disc-player – that was the UBD-K8500 from 2016 – but it is a more refined product. For this price (and already we've seen it offered for a little less), the UDB-M9000 looks good. The slight slant on its front sets it slightly apart from the black, oblong box designs of its competitors. On the front is a USB 2.0 connection, hidden underneath a panel. On the back, Samsung has taken a minimal approach to the number of outputs. Rather than two HDMI outputs for video and audio, there’s just one - it's alongside an optical connection and a slot for an ethernet connection. Wi-fi is built in. You can stream content via the menagerie of apps available on this player: Netflix, Amazon Video, YouTube, BBC iPlayer, All 4 and Wuaki.tv are accessible through the Tizen operating system, which displays them as tiles at the bottom of the screen. Unfortunately ITV Hub and Demand 5 aren’t available. You can also play music through Spotify or Deezer. Whether you’re playing a UHD Blu-ray or accessing content through the internet, the M9000 responds quickly without any notable lag. We’ve no complaints about the remote either - it looks like one of the smart remotes that come with Samsung televisions and is just as easy to use. With regards to set-up, Samsung has got pretty close to a plug-and-play experience. While there are a few settings that will need your attention (like turning Dynamic Range Control off to avoid the player compressing your audio) there isn’t much needs meddling with. An interesting feature on this player is the Fit Screen Size setting, which compresses the picture to give you a nice (though pointless) border around whatever you’re watching. It’s visually impressive, but it does mean that the M9000 has to do some down-scaling, which could result in a degraded picture. We wouldn’t necessarily recommend using it. One thing that is lacking, and stops this player from being fully future-proof, is Dolby Vision – a technology from Dolby that uses ‘dynamic metadata’ to optimise the image frame-by-frame, giving you peak picture performance. This feature is also absent on Sony’s UBP-X800 and Panasonic’s DMP-UB900, so the Samsung isn’t unique in this respect - but those desperate to have it might stray towards the similarly priced LG UP970. Starting with Planet Earth II, one of our favourite 4K HDR test discs, it’s immediately obvious how punchy the colours from the M9000 are. The blue of the sky above the Himalayan Mountains is azure, and the sun-baked rocks of the Arabian Peninsula are a rough, scorched red. This feels like a player ready to show off. It has a similar character when it comes to how it handles detail. Textures like the fur on a snow leopard, or the tensing muscles of the Alpine ibex, are rendered well. Changing to Deadpool, the shards of glass hanging in the air as the superhero flips a car over have a satisfying glint to them. Without a doubt, the M9000 gives you a spectacle - but it doesn’t top our current favourite, the Sony UBP-X800. The Samsung oversteps the boundaries just a tad and doesn’t look as natural as it could. Colours are a bit too overt, and skin tones ultimately fall on the over-saturated side. Similarly, the subtle detail that reveals separation of the foreground and background of a mountain range isn’t as well-resolved, making the picture look a little flat. Moving down to a 1080p Blu-ray of Guardians of the Galaxy, the M9000 takes the change in quality in its stride. The upscaler won’t fool you into thinking that you’re playing native 4K content, but it manages to capture a lot of the detail in Rocket Raccoon’s fur, and the wooden texture on Groot’s face when the prison spotlight shines on it has a nice gradient. This Samsung struggles with the more taxing job of upscaling DVDs, though - the Panasonic DMP-UB900 does it more effectively. Playing Scott Pilgrim vs The World, the detail in Scott’s hair and shirt isn’t particularly plentiful - but it’s still a perfectly watchable image, one that should keep you happy. When it comes to sound quality, however, the Samsung M9000 falls behind its competition. It performs competently, but the Sony UDP-X800 and Panasonic DMP-UB900 quickly overtake it when it comes to dynamism and detail. That’s somewhat to be expected - they are more expensive. But the price difference isn’t great enough to overlook the Samsung’s shortcomings. We connect the player up to the Sony STR DN1080 receiver and play Fleetwood Mac’s The Chain via Spotify. When the track eventually hits the iconic bass riff, the M9000 doesn’t quite have the same finesse in the bass plucks we would expect. And in the midrange, when singer Lindsey Buckingham spits out the lyrics, the quiver in his voice isn’t explicit. There’s emotion, but it’s not as obvious as on other players. When we switch back to Planet Earth II, the opening orchestral score is reasonably dramatic, but doesn’t rise and fall with the same delicacy or precision. The M9000 has acceptable sound in its own right, and you shouldn’t be concerned about harshness at any point in the frequency range. But compared to other players on the market ,Samsung still has some improvements to make. For a £280 Blu-ray player, the Samsung UBD-M9000 is a good effort. Its picture is pretty detailed, and it’s always eager to demonstrate its vivid colours. If you’re looking to save a little money, or prefer Samsung’s user experience to that of LG’s, Sony’s or Panasonic's, this Blu-ray player will keep you content.